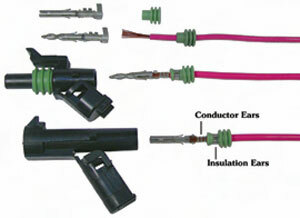 These connectors require a special crimping tool, makeshift methods will result in an unreliable connector and unsatisfactory seal. Strip wire 3/16 inch and install the terminal seal. Position terminal (you may squeeze the insulation crimp lightly with your fingers to maintain position while crimping). 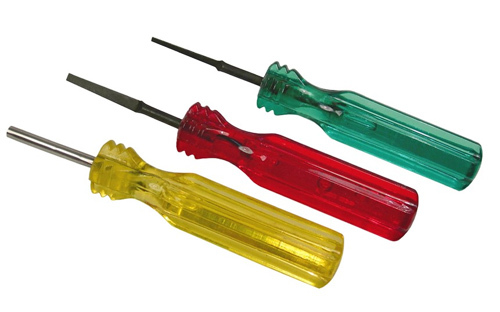 Crimp the terminal - the tool crimps the wire and the dust seal/strain relief in a single operation. Both the wire and insulation have perfect crimps! Just snap the terminal into the connector body and you're done. If you ever need to remove a terminal from a connector body, use the Weather Pack Terminal Extraction Tool.